As mentioned before, I have been on a Cary Grant kick since November. I've been systematically going through his filmography, watching films previously viewed and discovering others that I hadn't even known existed. This film is one such. I watched it more than a month ago. But between being extremely busy with the Van Shipley post and the website, besides other professional commitments (I do wish someone would pay me to watch films and write about them!) I never got around to either getting screen shots or writing it up. Finally, since the DVD came from Netflix, and it had been gathering dust for over a month, my husband put his rather large foot down and thundered, "That man must go!" And then, a few days later, he said, "I want that man out of the house!" and then, "I'm telling you, I won't stand for it! Either that man goes or..." He was wise enough not to complete that sentence. (I did mention on another blog that he was rather intelligent.) I did hear him mutter something about having to compete with "...dead mouldering malodorous bodies ravaged by maggots and suchlike..."
Jim Blandings (Cary Grant) is a brilliant ad executive. He lives in New York, in a tiny little apartment (It didn't look so tiny to me! But it had too much furniture.) with his wife, Muriel (Myrna Loy), and their two daughters. Mornings are always chaotic since the girls have to go to school and Jim has to leave for work and Muriel has to get ready - and they have only one bathroom, and not enough closet space. Things are always falling out of cupboards when they are opened, and the chests of draws do not quite shut. Consigning Bunky Funhauser to the rubbish heap as a fop who 'wears open-toed sandals', Jim leaves for work, already stressed. There, he is greeted by his assistant who informs him that the company's bête noire, the Wham Ham account, has been transferred to him. The up and coming young executive who had been working on that account for many months was fired that morning for 'losing his touch'. Jim is not happy. Besides, his house woes occupy his mind. It is then that he catches sight of an advertisement to own property in neighbouring Connecticut - why, for slightly more than the $7000 that Funkhauser was charging them to remodel their teeny-tiny apartment, they could own a home of their own, custom built according to their needs! Impetuously, Jim makes a quick trip to Connecticut with Muriel. The real estate broker can smell a a 'sucker', oops, customer, when he sees one. In a master move, he manages to sell Jim the broken-down house, a 'fixer-upper', for $200+ a yard.They sign the mortgage with the owner, and then, full of pride and happiness, they go to Bill. "It's a steal, Bill," exclaims Jim. Bill takes one look at the purchase agreement and informs Jim that it was not a 'steal' but a swindle. Why, what on earth does he mean? Well, land in Connecticut is sold to locals at $40 a yard; the price goes up to $100 a yard for city slickers; Jim, though, paid double even that. Jim is taken aback but quickly recovers his poise; heck, so what? Are they going to quibble over a few dollars here or there? They have a house! And so, the Blandings take Bill to see their latest acquisition. All it needs, says Muriel, is someone to love it. One look at the tiles falling off the house, and Bill tells them that he is glad there are two of them - one to love it and the other to hold it up! He offers to call in a structural engineer to see what can be done. 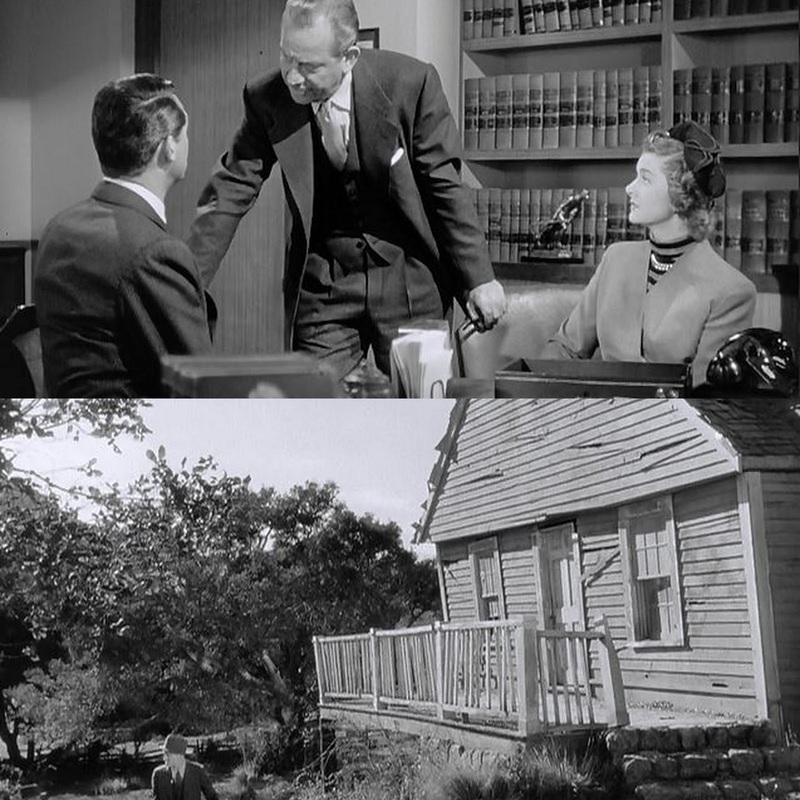 And so, Bill's expert comes, looks, finds the house structurally unsound and says laconically, and it seems to poor Jim, rather unkindly, "Tear it down!" Muriel offers some comfort. They will get in their own experts. So they do. Two of them. One after another, both say, "Tear it down!" They already have an architect, Simms (Reginald Denny) who was to renovate their house for them. Now, of course, he will design and build a new one. Simms is caught unawares by his new clients - between the two of them, they turn his design upside down. Muriel wants four bedrooms with en suite bathrooms; Jim wants a playroom and a little patio outside where he can grill. Muriel wants a sewing room, and a little flower room - and so on and on they go, exhorting Simms all the while to keep the costs under $12,000. Finally, they get something that is nothing like Simms' original design. Simms calls for estimates from contractors. Hearing the initial estimates, more than twice what they had budgeted for, smacks Jim back to reality. They cannot afford to build a house. He invites Simms to send him a bill for services rendered, after which, he says, he will throw himself off the bridge. Muriel and he walk out, only Muriel's gaze is drawn unwillingly to the board displaying the architectural drawings of their house. And so, of course, they decide to build the house anyway. Again, Simms is caught by his clients' unreasonable demands. Four bedrooms, four bathrooms, a sewing room, a utility room, a laundry room, a flower room, a living room, dining room, family room, play room... the list is endless, and the cost escalates exponentially. Muriel is adamant - she cannot sacrifice the health of her growing daughters, she says, by having them grow up in a house without four bathrooms. 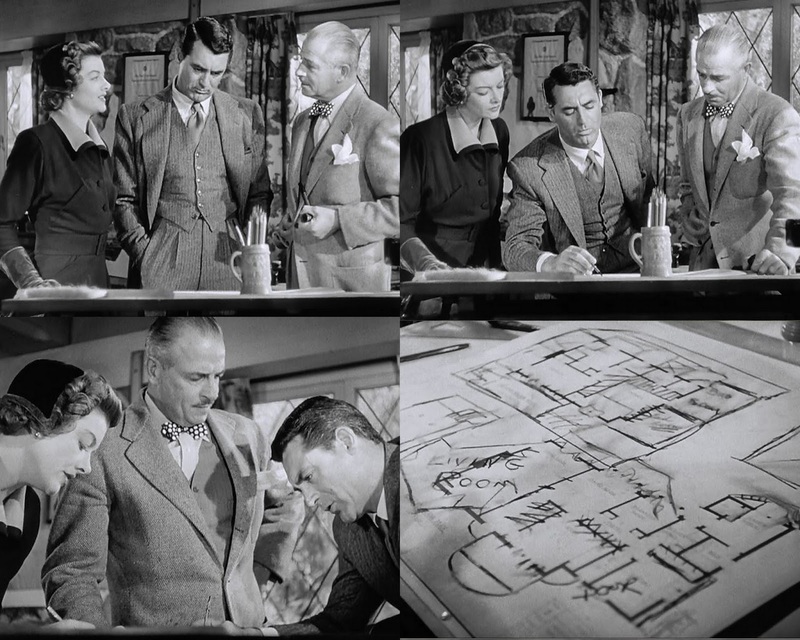 "But, Mrs Blandings," exclaims the sorely-put-upon Simms, "a small 8' by 10' by 8' bathroom with top-of-the-line fittings will cost $1300!" Jim is aghast. For $1300, his girls can rough it in a house with three bathrooms! Besides, he is also giving up his playroom! Just then, Bill explodes into the house. What on earth was Jim thinking of? In fact, what on earth was Simms thinking? As he continues to froth and fume, Muriel looks sadly at Jim - "What did you do?'" Jim is bewildered. "I don't know!" he says. "They won't tell me!" It appears that Jim has had the old house torn down without getting written permission from the lien holder, and is therefore in deep trouble, because the man who holds the mortgage wants the entire $6000 to be paid to him immediately. Jim clearly hadn't read the fine print. And Bill is not very comforting. "The next time you're going to do anything or say anything or buy anything," he says to Jim, "think it over very carefully. When you're sure you're right, forget the whole thing." But he is friend enough to stand surety for a loan. Jim is relieved and grateful. That lasts until Bill takes leave of them, shaking hands with Jim, and kissing Muriel good-bye. "What's with this kissing all of a sudden? I don't like it. Every time he goes out of this house, he shakes my hand and kisses you." Muriel is not much help. "Would you prefer it if he did it the other way around?' she asks humorously. Jim shakes his head at his own irrational jealousy. They haven't begun to build yet, but Jim has already shelled out $13,000-odd to tear the old house down. Muriel comforts him. They now have the best vacant lot in Connecticut. But is it really? Everything that can go wrong, does. They strike a rock ledge and need to get dynamite to blast it before they can dig the foundations. Worse is to come. The well being dug, paid for by the foot, has reached a stupendous depth of 200+ feet without striking water. The place where the cellar should be is flooded when they strike water at 2 feet. Now they have to wait for machines to pump the water out before they can lay the foundation. And all the time, money is being spent like water. Finally, when it is all sorted out, and the house begins to take shape, they overhear the workers wondering why someone would buy a lot on the windiest hill in Connecticut, and then build a house on its windiest side. It is all these New York millionaires, says the older, experienced worker to the other; they have money to spare. Bill, at least, is amused. Not so much Jim, who is beginning to feel the pinch, and the stress. Also, there is the small question of an advertising slogan and its deadline hanging over Jim's head. This account has already destroyed the careers of the ad executives who were assigned to it. On top of that, Jim is beginning to suspect that Bill and Muriel are having an affair... Jim's dream house is turning into a nightmare. His job is on line as the deadline approaches and he has no creative spark left in him. Will he lose his house, his savings, his job, and his wife? Based on Eric Hodgins' novel of the same name, it first made an appearance as a short story in Fortune magazine; it was later reprinted in the Reader's Digest. Hodgins based the story on his experience buying and building a home in New Milford, Connecticut. Scriptwriters Melvin Frank and Norman Panama adapted the story, adding humorous subplots about Jim's job woes, and Bill's relationship with Muriel. 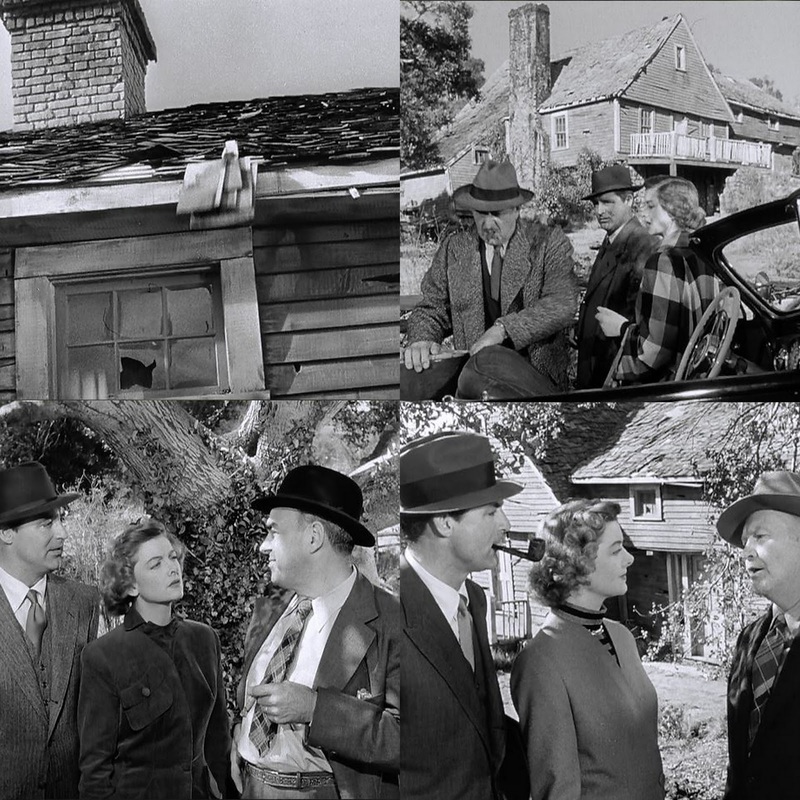 The chemistry between the leads, the scintillating wordplay, Mervyn Douglas' wry commentary and his turn as the Blandings' long-suffering lawyer, never once hitting a wrong note, all add to the film's attraction. While Cary Grant was always the first choice for the tole of Jim Blandings, Muriel's role was offered to Irene Dunne. Unable to sign this film because she was then shooting for I Remember Mama, the role went to Myrna Loy. Grant made his Jim believable, and there's always a touch of class and sophistication as he portrays the harassed advertising executive. Myrna's charm, and her sparkling humour lend colour to Muriel, and complements Grant's Jim to make for an eminently watchable film, not very taxing, no preaching, no subliminal messages, just a simple story with top-notch acting, lots of smiles, and some genuinely laugh-out moments. "dead mouldering malodorous bodies ravaged by maggots and suchlike"
I don't think my husband is jealous. : > ) And definitely not of Cary Grant (or any of his ilk). He just wanted to get the next DVD in queue. The dialogues sound hilarious, and I love both Cary Grant and Myrna Loy. Despite your saying it isn't one of his best films, maybe I'll put it on my list! Madhu, : ) Don't blame you. That is the first picture that came into my mind when I heard of this film. Oh, do watch it. It is very, very watchable. 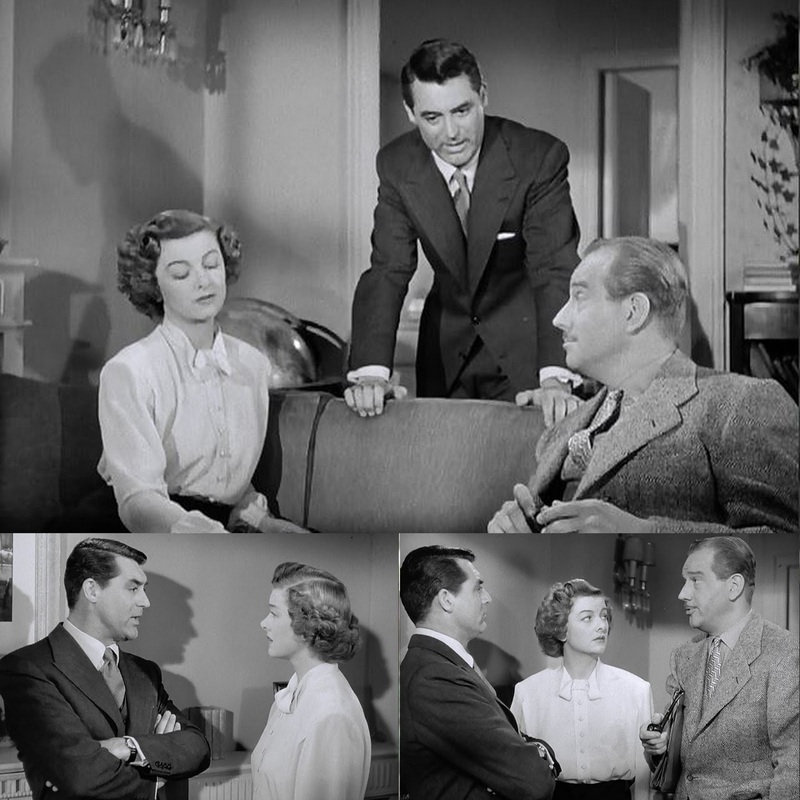 And Cary Grant seemed to have had fun shooting it, because he played his part to the hilt. I had never ever heard of this film before. First I thought, wow, a Cary-Grant-Wodehouse film! Cary Grant films are always amusing aren't they? But I should admit comedies on building houses always make me feel sad. Don't ask me why, but they do. maybe I just hate the notion of building a house! You're not the only one, harvey! This film was 'new' to me when I first saw it listed. And last month was the first time I actually watched it. So it's a 'new' old film. If you watch this, I can almost guarantee that you will never build a house. I also register my application for membership to 'I've-not-heard-of-this-film' club. Oh, how I can relate, Banno! See if you can get your hands on this one. 'tis worth a couple of hours of silly grins. That was a hilarious post, right from the beginning. I never heard about this film but now I think it should be a must watch. I am a Cary Grant and Gregory Peck fan so I know I will enjoy this one. Thanks for introducing us to this film. Thank you, Shilpi. I'm sure you will enjoy this. Grant was hilarious!